Spacious 5BR , 3 Bath home, Panoramic Ocean Views! Owner has openings at this home and other similar homes nearby (all beachfront). Please CONTACT OWNER via phone or email for details before attempting any online bookings. Peak season rentals are from Saturday to Saturday. Long weekends and Winter/Spring holidays available in the off season. Cozy gas fireplace. Wireless Internet. This beachfront home offers over 2000 SF of living space, much larger than nearly any other Southend properties. This spacious, newer home has nice furnishings and fantastic upgrades. Featuring 5 bedrooms, 3 full baths, elevator, gas fireplace, hardwood floors, expansive decks including decks off the master bedroom, and off the back BR on the street side at the rear of house. Beautiful open floor plan kitchen with big center island for family gatherings and meals. Stainless steel appliances, dining room seating for 11 people, lower level for parking, and beach level showers. The kitchen, LR, and DR all have big ocean and beach views extending all the way north to the Atlantic City skyline. Direct beach access from home. ON the beach with direct ocean and beach access and views. Direct beach access from the property and full beach views. Panoramic and full ocean views. Optional in house linen service available. Plus ADDITIONAL full size fridge freezer in ground level storage room. Keurig K-Cup supplied. Full regular coffee pot as well. Fully supplied kitchen for all your cooking needs. My siblings and I took our parents for a long weekend to our favorite place of Ocean City as a Christmas gift. Our first impression as we entered was the magnificent ocean view. A well appointed kitchen and living room worked so well for us as we played games, looked at old slide pictures and photo albums and had wonderful times of reminiscing. The bedrooms and 3 full baths were a bonus as well as the washer and dryer. Scott went above and beyond to make this stay one that we will never forget. We definitely hope to rent with him again. 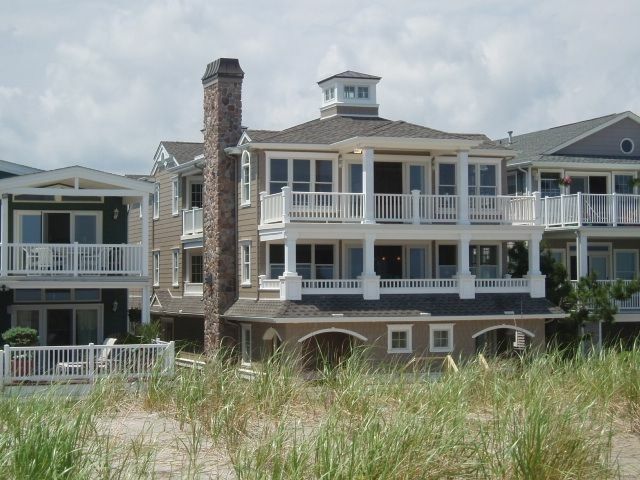 We thoroughly enjoyed our winter stay at this lovely beachfront house. The ocean view was fabulous. The property was graciously appointed and well maintained. Enjoyed the little Christmas touches. Scott was very easy to contact and catered to our needs. My family had a wonderful time in OCNJ. The house was so nice and clean. We stayed on the first floor and had a perfect view of the ocean! The kitchen was beautiful. I loved that there was filtered water through the refrigerator. The keurig was great! The house has all the appliances you need. The fireplace made it cozy on our cool week as well. Scott was very friendly and was very quick to respond to my emails. Thank you so much for a wonderful and very special week! Hope to be back again soon! This home is simply magnificent! It's impeccably decorated and has all updated amenities. The ocean views are spectacular and has beach access that is literally a few steps from the back door. The owner was extremely accommodating and very helpful. Can't wait to go back! A beautiful home in a beautiful setting! We had actually planned to rent a different home from the owner, Scott. However, when some construction work was being scheduled for the first home, Scott offered us the choice of staying at the first home (and he would defer the start of the work until after we left) or moving up to this home. We chose the latter and were not disappointed. It was more room than we five adults needed but what an amazing experience! The home is every bit as lovely on the inside as the exterior pictures suggest. The home came equipped with everything we could possible need. It was immaculately clean. The beds were comfortable. The appliances were new and worked perfectly. The home was just as it was described. Scott bent over backwards to make sure our stay was pleasant and delightful. He even personally brought in a gas grill so we could cook some hot dogs! Some of our greatest memories from this trip are sitting on the covered porch in the morning, listening to the surf and watching the waves roll up on the beach. Very peaceful. We look forward to returning one day! A great house in an ideal location. We were in search of an upper level beach front unit in the southend of OC, away from the crowds and this home fit the specs perfectly. The house is beautiful - clean, well equipped, and very comfortable. Its modern features, appliances and layout make it the perfect setting for a large family (we had 3 adults, 3 college children, and at least 2 additional overnight friends most of our week). It's also great for a gathering of adult friends for a reunion or just relaxation. The southend beaches are large, uncrowded and right out the door. Views from the upper level are magnificent morning, noon or night. The garage and drive allow for 2 vehicles off-street, which was necessary for us. The elevator was a great asset for move-in day, but otherwise we never had the need. The extra refrig in the garage was a bonus we did not expect, however, it was nice to have. The grill worked fine for our two bbq nights. There is enough room for everyone to have their own space or gather around the large dining table for meals, games and conversation. Scott is a great landlord, very responsive, answered all of our questions prior to rental, and was there to welcome us upon our arrival. His welcome included wine, flowers and very delicious cinnamon buns - thank you Scott! So, if you are looking for a beach front luxury home in the southend of OC, you will find this property the answer to your search. Just don't take our week! Ocean City's eight miles of beautiful beaches were rated one of the 'Best Family Beaches in America' in 2007 by the Travel Channel. Ocean City's two and a half mile boardwalk is lined up with shops and restaurants of every kind, movie theatres, amusement rides, miniature golf courses, and a water park like no other! Downtown Ocean City spans from 6th to 11th Streets on Asbury Avenue and provides a unique shopping experience featuring art galleries, dining, boutiques, jewelry stores and so much more. The City provides a wide variety of restaurants from fresh seafood and steaks to pizza and sub shops with over 100 choices throughout the island.